Plug and play. Both the power supply and the single detectors count as accessories for the photon counters. 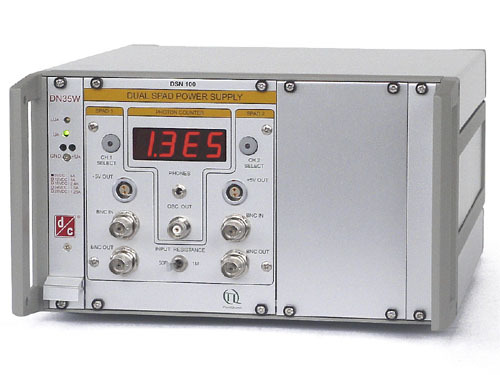 The DSN102 is a two-channel voltage supply for the single photon counting modules of the COUNT® series from Laser Components. It controls and monitors the operation of two detectors simultaneously. With the built-in counter you can also see the counting rate of a selected module. There is a BNC interface to connect an oscilloscope or other measurement devices for further diagnosis and controlling the detector setting. The output voltage is proportional to the logarithm of the counting rate. In addition, an acoustic counting rate display (loudspeakers/earphones) was built into this device. Applications include general photon counting, spectroscopy, illustration of fluorescence life expectancy (FLIM), confocal fluorescence microscopy, single molecule detection (SMD), FCS, and FRET. The device is available in a single set or as an OEM installation module for a 19” subrack.